Comm Eye Health Vol. 17 No. 49 2004 pp 06 - 07. Published online 01 March 2004. Vision is the ability to see with a clear perception of detail, colour and contrast, and to distinguish objects visually. Like any other sense, vision tends to deteriorate or diminish naturally with age. In most cases, reduction in visual capability can be corrected with glasses, medicine or surgery. However, if the visual changes occur because of an incurable eye disease, condition or injury, vision loss can be permanent. Many people around the world with permanent visual impairment have some residual vision which can be used with the help of low vision services, materials and devices.1 This paper describes different options for the enhancement of residual vision including optical and non-optical devices and providing training for the low vision client. Optical devices consist of one or more lens placed between the eye and the object to be viewed, which increase the size of the image of the object on the retina. Low vision devices work on the principle of optical magnification and provide an enlarged image of the object. 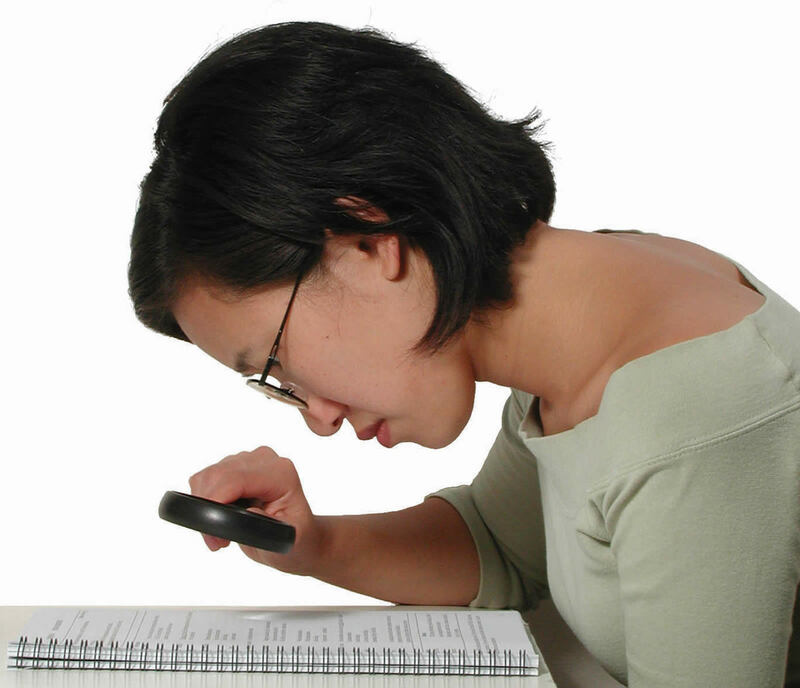 Magnifiers can be prescribed as hand-held, hanging, stand, illuminated hand-held, illuminated stand, spectacles or bar and dome magnifiers. 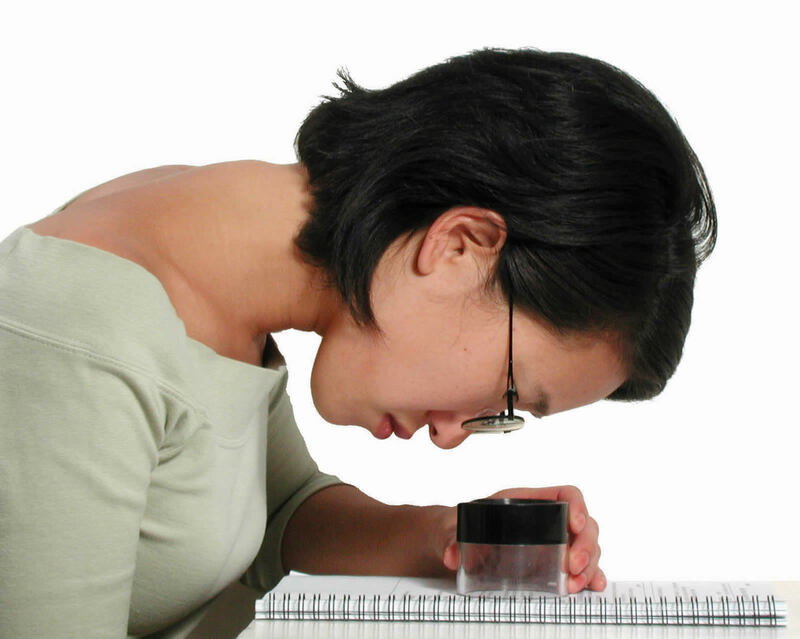 Spectacle magnifiers are the most commonly prescribed magnifiers. They come as full aperture, half-eye, or bifocal with base in prisms for binocular viewing. For people with low vision, telescopes with magnification powers from 2x to 10x are prescribed. These are prescribed for distance, intermediate and near tasks. Types of telescope include hand-held, clip-on, spectacle mounted and bioptic designs. Traditionally the power of Low vision devices is denoted as x, which means the relative increase in the image size to the object size. For example a 2x would mean an increase in the image size by two times. As different manufacturers use different methods to calculate this, there is a growing trend to move away from this labelling and denote the powers of magnifiers in dioptres or as equivalent viewing distances (EVD). As glare may be a significant disabling factor in many eye conditions, tinted lenses are routinely prescribed along with ‘caps’, ‘hats’ and visors. Absorptive filters are tinted lenses, which are used to counter glare. They come in different tints at various levels of absorption and different cut-off points for the visible spectrum of light. For an accurate and appropriate final prescription, the low vision clinic should have a range of magnifiers, telescopes and absorptive filters. Non-optical devices are items designed to promote independent living. They alter environmental perception through enhancing illumination, contrast and spatial relationships. A useful slogan to remember the key to non-optical devices is ‘Bigger, Bolder, Brighter’. Devices may include illumination devices such as lamps and reading stands, check registers, writing guides, bold-lined paper, needle-threaders, magnifying mirrors, high contrast watches, and large print items such as books. To provide advice on non-optical devices, there should be a range of options available for demonstrating and training the client in their use. This advice can be given by any appropriately trained eye care worker. For people with severe visual loss, electronic devices are an option. There are two types; optical devices which display the task in a magnified form from a television monitor, and non-optical electronic devices which are conversion systems that convert text into a speech system. Electronic optical devices make use of a zoom television camera to magnify materials onto a television screen. They are called closed circuit televisions (CCTVs). The advantage of a CCTV is in its greater amplitude of magnification of 3x to 100x, normal working distance and reversed polarity (e.g. white on black). The disadvantages are the cost and the bulk of the system that makes it quite immovable. Non-optical electronic devices include talking watches, talking calculators and speech and Braille conversion systems. With further developments in electronics, more and more devices are becoming available for people with low vision. It is important to keep up-to-date with these developments so that the best options can be offered to clients with low vision. Functional vision may be improved with training. Many people can learn to make better use of their low vision and can function efficiently with only small amounts of visual information. Objects and print can be recognised when they are blurred or when only parts of them can be seen. Visual functioning plays a very significant role in promoting independent living in people with low vision. Whether the disability is mild, moderate, severe or profound, if people with low vision are given proper training in visual skills, they more often than not show an improved performance in their day to day activities and move closer to leading an independent life. Effective use of residual vision by teaching the client visual skills such as eccentric viewing, tracking, scanning and pursuit movements. There are many exercises and training programmes available for clients. Use of prescribed devices especially telescopes and magnifiers. The final advice and prescription need to conform to the client’s needs, and should be culturally appropriate, affordable and accessible. One of the major impediments to providing low vision services has been the high cost of Low vision devices available on the market. The Low Vision Resource Centre of the Hong Kong Society for the Blind now supplies Low vision devices and assessment materials at affordable cost to developing countries. The new Centre has catalysed development of low vision programmes in many countries and is likely to have an even greater impact in the future. The LVDs and the assessment materials and equipment listed in the Recommended Standard List (see VISION 2020 Standard List for Low Vision Services WHO/ IAPB) are available from the VISION 2020 Low Vision Resource Centre of the Hong Kong Society for the Blind. The catalogue is on www.hksb.org.hk. As part of efforts to promote knowledge transfer, Kilimanjaro Centre for Community Ophthalmology (KCCO) and the Ophthalmic Resource Centre for Eastern Africa (ORCEA), in collaboration with the Low Vision Unit at Kikuyu Hospital in Kenya, are planning a periodic email mailing on low vision. This will include regular information about low vision and early childhood intervention, case studies, useful articles, etc. If you wish to be included on the low vision mailing list, please send your request to KCCO@KCMC.AC.TZ.